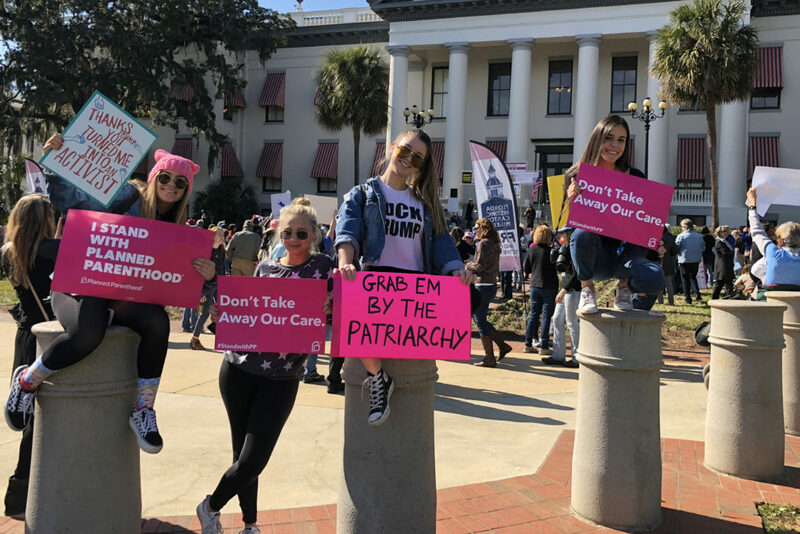 Local protesters unite at the Old Capitol building for the 2018 Women’s March. 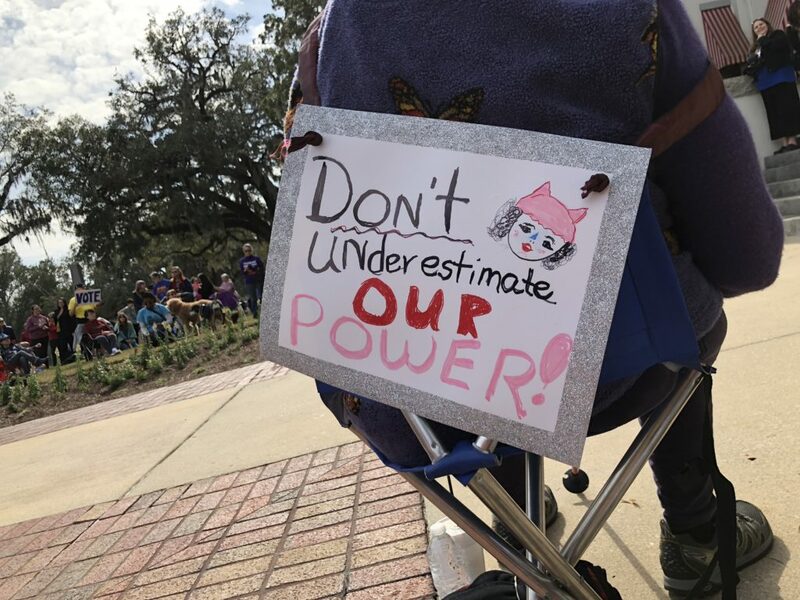 While the turnout for the Women’s March was smaller than last year’s, participants were clearly in support of female empowerment as they denounced President Donald Trump’s position on LGBT rights, immigration, abortion and other political issues Saturday at the Old Capitol. 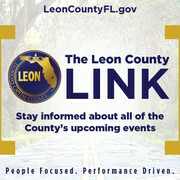 An estimated 14,000 attended last year’s inaugural march in Tallahassee. However, organizers said 450 showed up this year. 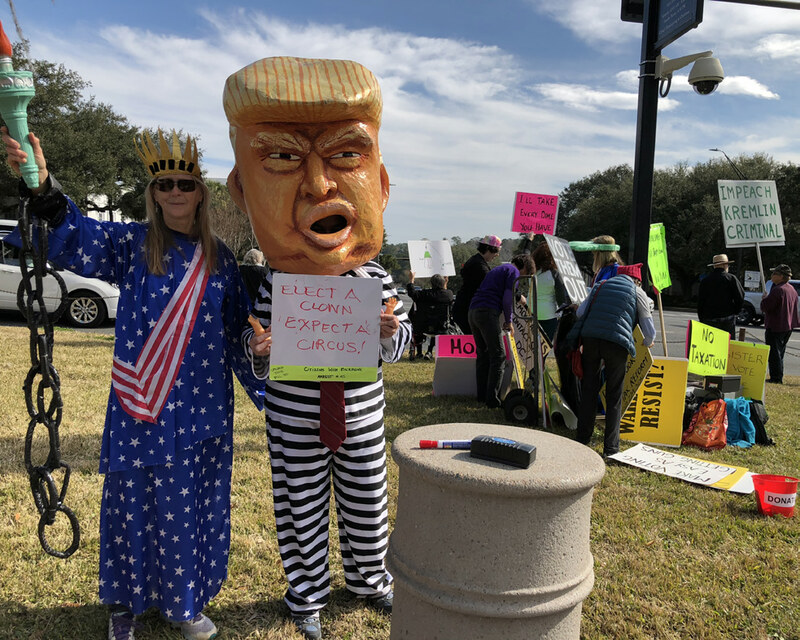 Hundreds of thousands also marched around the country, echoing concerns about many of the same issues as those at the Capitol. Denise Spivey, a member of the organization Indivisible Tallahassee that opposes Trump, said the “blue wave” is an effort to push for electing Democrats and Progressives. Some passersby honked their car horns in support of the protestors, while others flipped them obscene gestures. For about two hours speaker after speaker delivered messages that advocated for not only women’s rights but issues such as gun control, racism and the environment. The Mickee Faust Club, known for its wiley ways of protesting in songs, used the march as a platform to deliver yet another of its popular performances. “I really feel that we’ve got a beautiful coalition growing right now,” said Jessica Tice a member of the Faust Club. “I feel like whenever there’s sort of darkness in society that good people come together and collaborate and get aggressive. She went on to detail her story of discrimination. When she was matriculating through graduate school in Texas, she was discriminated against by her job and evicted from her home because of her sexual orientation, she said. Tice, along with fellow Faust member, Lea Anna Davis, voiced their pride in the way the club actively approaches inequalities. Ignacia Araya and her peers Sydney Glazer, Alex Zeidel and Maya Villiers were clearly protesting against Trump for his treatment of females. 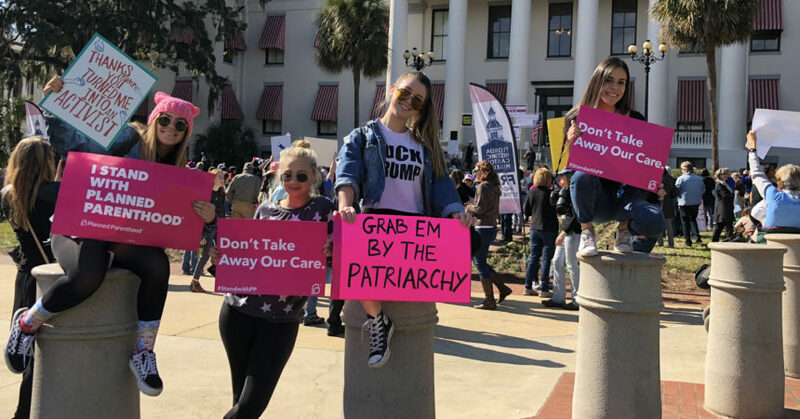 The four women held up signs that read: “Thanks Trump, You Turned Me Into An Activist,” and “Grab ‘Em by the Patriarchy,” referencing the lewd comment made by Trump in 2005 that resurfaced during his campaign. Some suspected the size of the turnout was the result of an obvious absence of college students’ participation at the march. “I didn’t see enough young activists as much as I thought I would,” said Araya. “It’s mostly just the older community, which I appreciate equally as much. But, it’d just be nice to see more college students out here joining the movement because it’s really important.